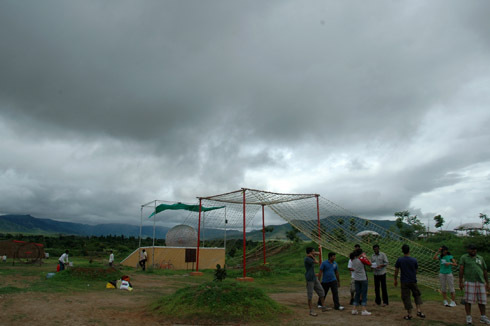 We had been to the adventure plus resort last monsoon as part of our team event. We went on a 2-day package with an overnight stay. Along with a colleague, i went on a weekend to see the place for ourselves before taking the decision to go there. We were impressed by the place and decided to take our team there for the weekend. This is a detailed review of the place/activities based on our visit. For those not interested in a long review, here is a shorter version of it. You get your money’s worth of activities at this place. I have not seen many places with such a wide range of activities at this nominal price. 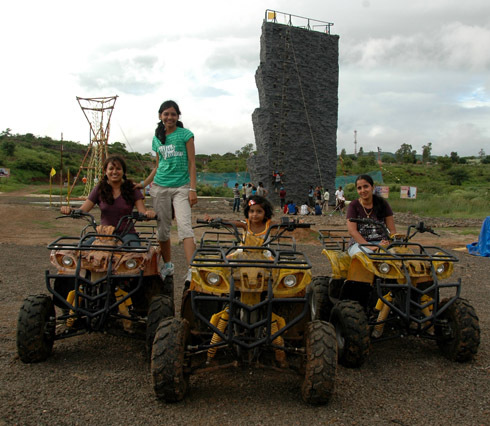 Compared to the other adventure resorts like the ones in Lonavala, the price adventure plus charges is peanuts. 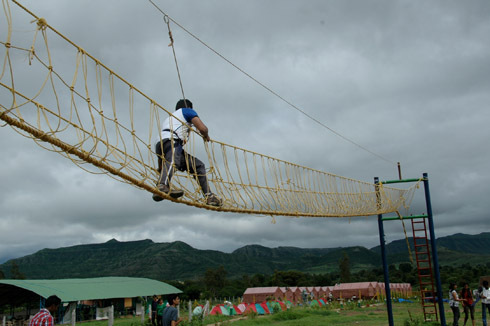 Imagine being able to do wall climbing, rappelling, Burma Bridge, Obstacle race, Rifle Shooting, Archery, Kayaking (Many charge a lot of money for just kayaking) and more PLUS lunch for around 700-800 rupees. This is as best a deal as you can get. 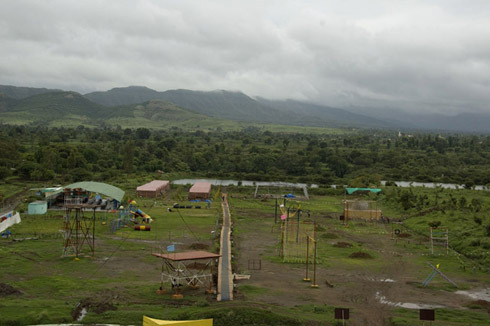 The place: Adventure Plus is located around 55 kms from Pune (Magarpatta City) near Bhor (on the road which goes through Bhor and Varandha Ghat). It would take around 1-1.5 hrs to reach the place if you avoid Pune city traffic. On the NH4 towards bangalore, you would see a left turn for Narayanpur Balaji Temple. Around a 100 ms beyond that, a small road goes to the right. 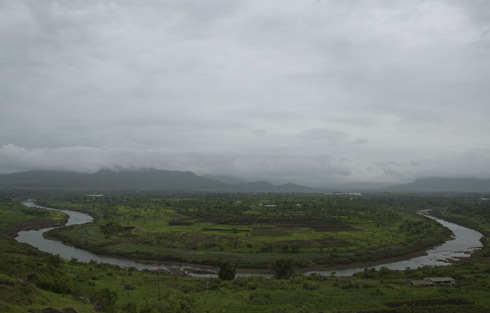 This is the one which takes you to Bhor and Varandha Ghat. 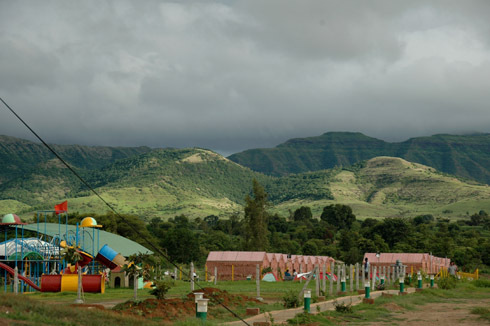 Adventure plus is located around 12 kms down this road. Watch out for this view on the left as you drive down this road. It is great during the monsoons. The various Activities along with my rating. Please bear in mind that this rating is purely my individual opinion. What i rate as 1/5 may be the most thrilling thing for you and what i rate as 5/5 may be as boring as watching Shah Rukh on Zor Ka Jatkha! 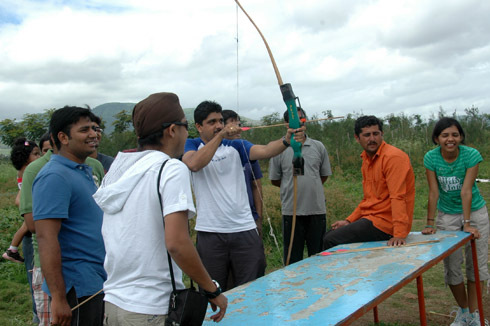 Archery (4/5). It was easy and fun. The equipment was in good condition and each of us had 5 shots at the target. 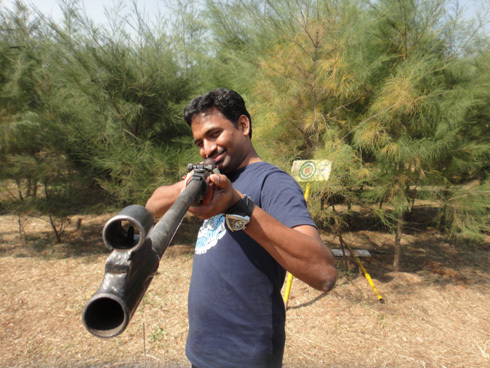 Rifle Shooting (3/5). The gun used was much better than the ones you see in the amusement fairs. The bullets were small ball bearings, so you really cant make out where they hit on the target, just that they hit the target based on the sound you hear. Burma Bridge (Adventure plus called this Rope Bridge) (4/5). This is great fun if you are doing it for the first time. 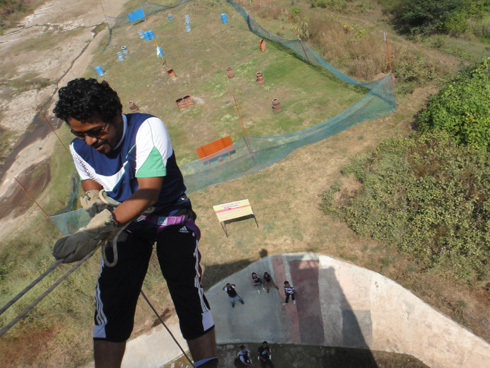 If you are scared of heights, it adds to the fun. You have to cross a section tied together by ropes. 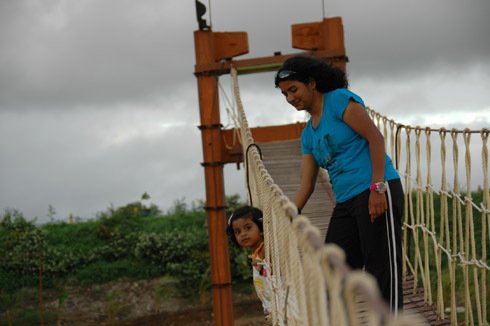 You are safe as you are held on by a safety rope, but it is fun to walk on a swaying bridge of rope. One guy started swaying so much that the bridge overturned. Of course, nothing happened to him. He was just hanging upside down from the bridge! 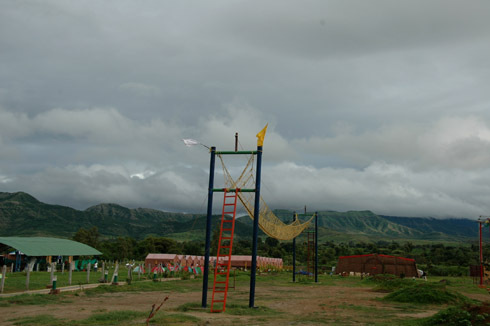 Army Obstacle Course (5/5). 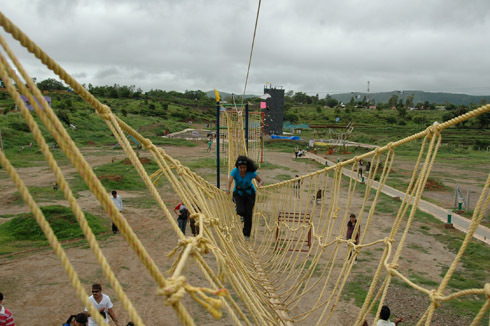 The obstacle race is actually a series of activities to be done one after the other. 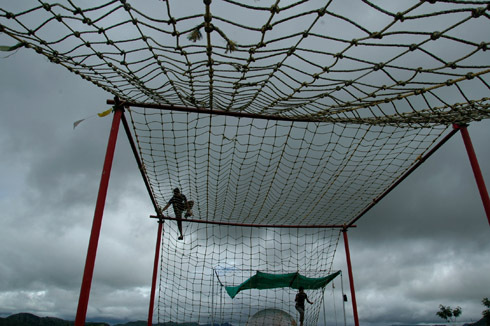 The spider net (the first photo above) was the most fun and technically the most scary as the top of the net is quite high and the fear of falling through the net is always at the back of your mind. Unless you are anorexic or intent on committing suicide, it is almost impossible to fall through. After this you have the other regular stuff like the tyre climb, balance walk and the tarzan rope. The last one is the commando net (the last photo with the guys posing for a photo) is also fun to attempt. 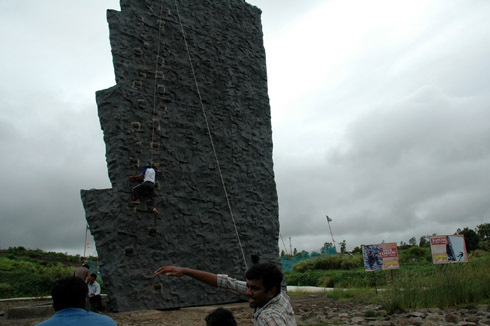 Wall/Rock Climbing (5/5). A very tall wall (50 ft) with an amazing view from the top i.e. if you do manage to climb it. It was a bit difficult wall to climb compared to the other ones i have attempted elsewhere, but where’s the fun without a challenge! Rappelling (5/5). I didn’t attempt this, but i heard that it was very thrilling to rappel down the side of the same wall from 50 ft up. They also have water rappelling where you have water falling down on you as you rappel down, but it was not functioning when we were there. 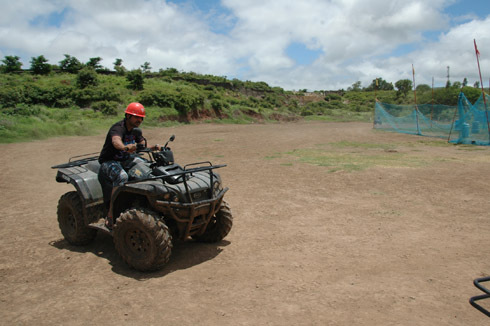 ATV Ride (3/5). The machines were in good condition. The only problem was that we were asked to drive around on a flat area (2 rounds). This was boring. 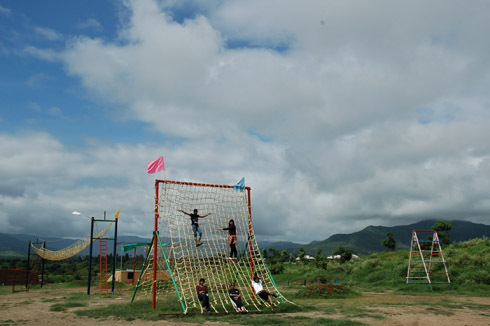 There was a good track on the periphery of this ground with lots of ups and downs, but it seems that many people got injured trying to pull off stunts in their first ever ride! So, they had discontinued this track. As per the latest info i have, they take people on guided trips to the nearby hills on rough tracks. This should be interesting and would be definitely worth a try. UPDATE(November 2011): I went for the second time with a different team. There was only one ATV because the others were also under repair. Even this one wasn’t in a very good condition that you would want to try it out. 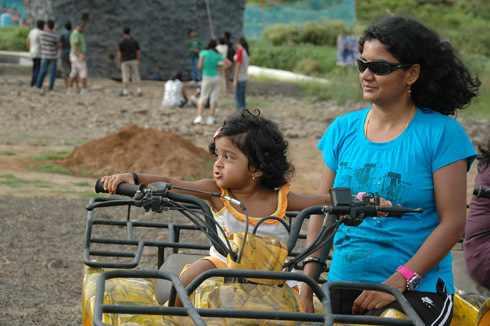 Also, you have to drive around the main ground 2 times for the 250 INR you pay. This is boring and also very dangerous. Few of the guys couldn’t control the ATV and ran over the sidewalk/plants. If they had hit someone, it could have been pretty serious. Cycling/Skates/Pogo (4/5). I am sure that you must be wondering what can be interesting when cycling is offered as part of the package. 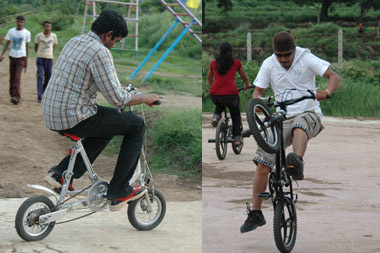 But it was, as you get to try so many different kinds of strange looking cycles. The skates were a bit tough to use. The pogo stick was fun. We did a small race around a big track letting people chose their own kind of cycle. 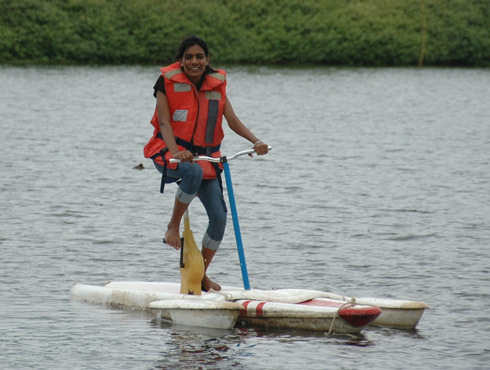 Water Based Activities (4/5). This was fun because of the variety offered. 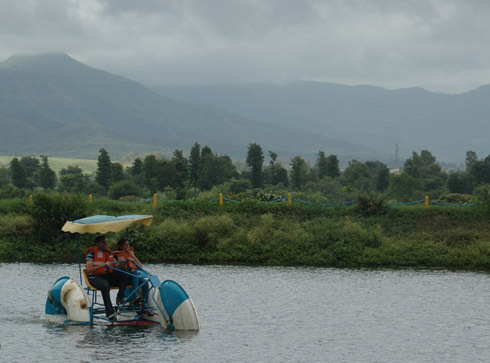 There were so many different types of vehicles to be tried like the Paddle Caddie, Hydro Bike, Floating Suit(for those who dont know to swim and experience the thrill of floating) and Water Roller (just for fun!). Rope Bridge a.k.a suspension bridge (4/5). A great place for photos. 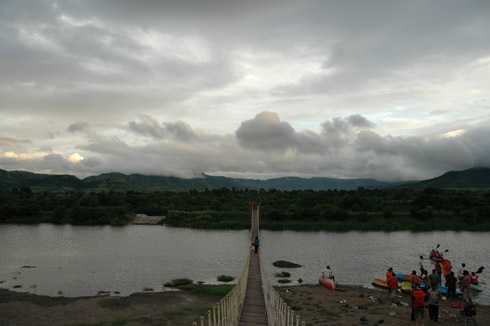 This was the bridge across one of the two water bodies (the other one is the one with the water sports). 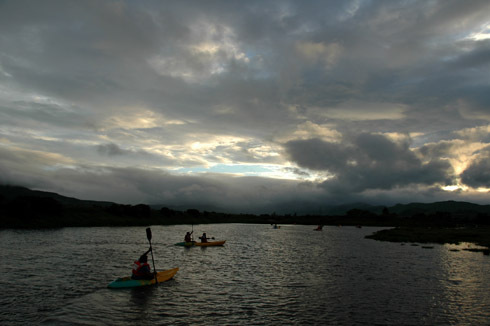 Kayaking (5/5). Was great fun. 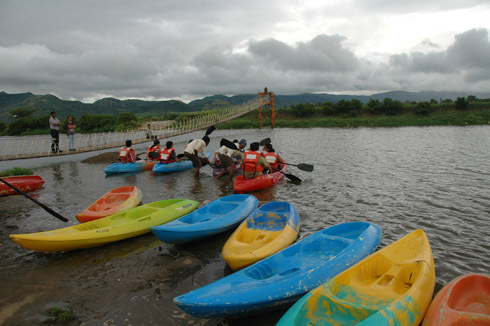 I had done kayaking few times before and still enjoyed it. Most of the guys were new to kayaking and had fun trying to understand the nuances of steering a kayak. The water body is a good 50 ms wide and at least 300 m long, so we arranged 2-3 races (on both the single and the double kayaks). To have kayaking included in the regular day package is amazing as this alone would cost you at least 200-300 bucks elsewhere. Rain Dance (5/5). I didn’t go inside as Akshara was feeling sleepy and it was getting cold. The guys enjoyed it a lot. 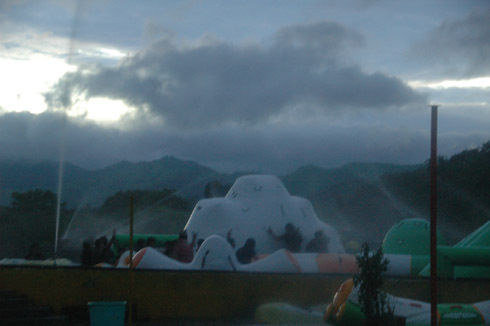 It is an open pool with lot of inflatables in different shapes. There were also water guns and water showers all over the pool. Add to it some loud music and it was like a water discotheque! 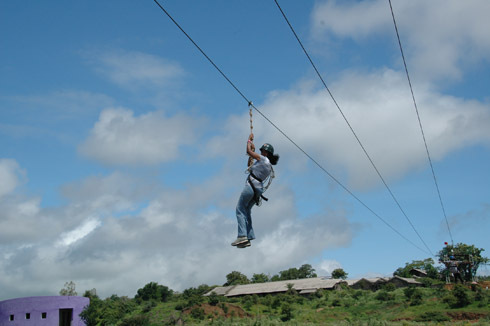 Ziplining (4/5). For those who were doing ziplining for the first time, it would have scored 10/5! 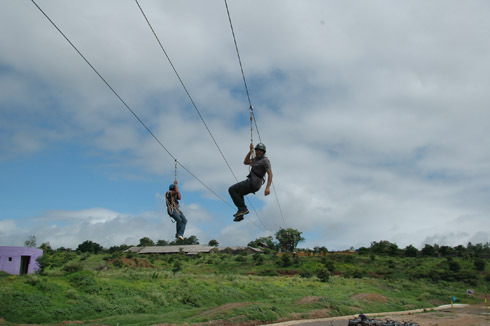 Supposedly the longest zipline in India, this is a thrilling experience. 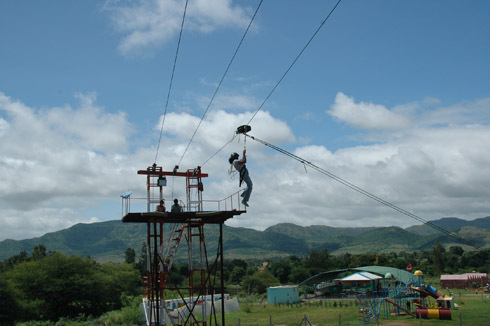 The climb to the top of the zipline is itself thrilling as it is at a considerable height. I am rating this as 4, as the previous zipline that i did had a much steeper descent and it was into the water! A must try if you have done it before. Paintball. We didnt try this, as many were not interested. 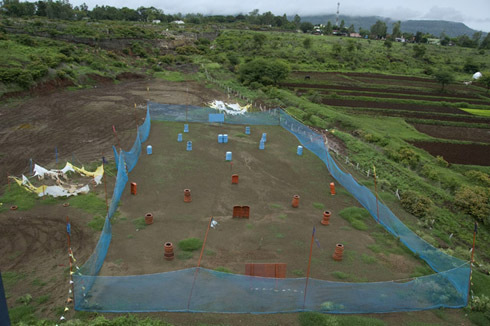 The paintball field looks ok, but not great. It would be better if it is played in more natural surroundings. 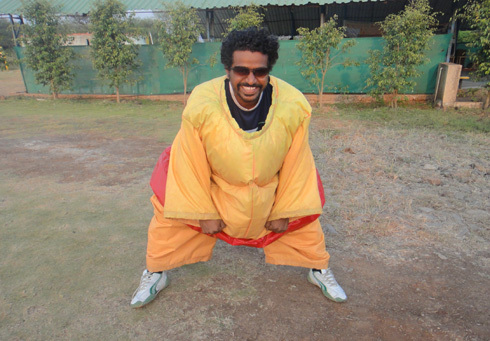 Sumo Wrestling (5/5 for the audience). Was lot of fun. Guys get into some ugly looking costumes to try to push each other to the ground. Wall Rappelling (5/5). Very thrilling, particularly if you are scared of heights. You rappel down the same wall which has the wall climbing on the other sides. Climbing the old staircase inside is itself scary. Once you are on the top, the height really gets to you. But, when you rappel, you are looking up and not towards the ground. So, you are not scared even a bit, at least until you decide to see what’s going on below you! Accommodation/Food (4/5). There are 2 kinds of acco available. The smaller swiss tents at 500 p.p with shared bathroom or the larger alpine tents at 1000 p.p with individual bathrooms and coolers.We took the alpine tents. They were pretty clean. 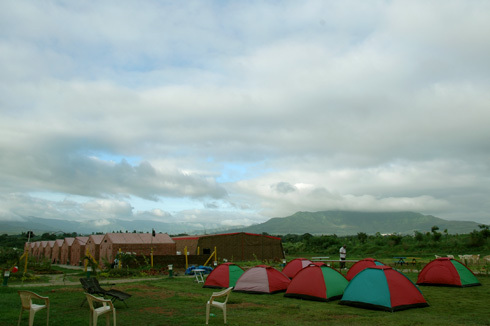 The swiss tents would have been more fun, but it was monsoon time and it got very windy/cold during the nights. The food was good, no issues. An excellent place to go in the monsoons or after, but not so sure during the summer, as all the activity is out in the open. Amazing value for money given the variety of activities. 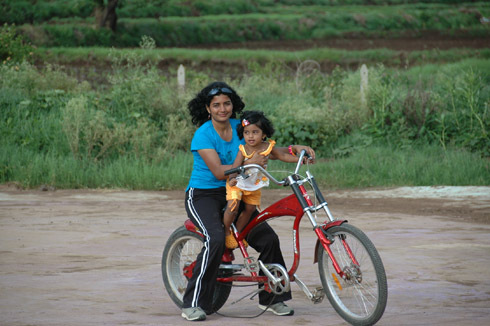 Very family friendly (We saw many over-sized Punjabi Aunties on a ladies day out, attempting the Burma bridge and they seemed to enjoy it). There are infact many more activities that i have not written about like Zorbing (Seems to be hot nowadays, but i fail to understand why you have to pay money to get dizzy 🙂 ), gyroscope and more. If you go there after seeing this review, say that the place was recommended by “Rajaram from placesnearpune.com ” :-). No, i don’t get a commission, but just some goodwill. Would like to know few more things as in if we can make our own barbeque and bonfire, are there any seperate charges for that. Is this a good season to visit the place. 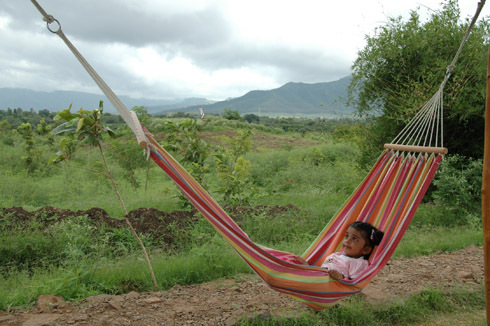 This is Swati. Me and ma collegues want to b there. so please let me know about Charges ,Staying facility ,Food ,this all tracking stuff… as soon as… u can mail me brochures also..
(nearly 35) can stand together and have lots of fun. Mainly looking for the team building activities. 🙂 Kindly please send the brouchure and let us know if there is any corporate or bulk booking discounts. I am looking for a place with adventure games in daytime and relax or musical fun time in night with drinks and nonveg food to celebrate firend’s bachelor party for 15 boys. 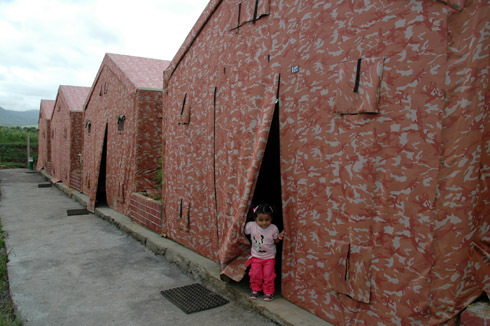 We will stay overnight there. Please let us know via mail with rates and details if any place you find suitable for us. I like to prefer adventure plus if above things valid there or equvalent to this will be great. 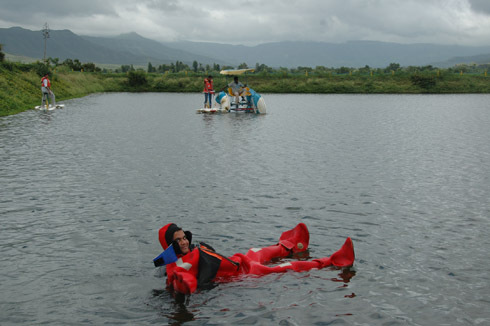 Hello I am looking forward to come to adventure resort . NOTWORTH GOING TO THIS PLACE,EXPERIENCED YESTERDAY.DROVE DOWN 70 KM TO THE PLACE TO SEE ONLY 2 PERSONS IN THE WHOLE AREA.WHAT EVER RIDES I SAW WAS SUBSTANDARD,NO WATER ACTIVITY AS THE LAKE WAS TOTALLY DRIED UP.SHEER WASTE OF TIME. Seems nice place…could you please tell me the rates of the adventures…just an average fees and complete address of the place.